Spring cleaning is exciting to those seek a fresh start to a new season. However, many dread it because of the enormity of the projects, time, and effort it takes to complete. Whatever their outlook on spring cleaning, most people agree it’s a wonderful feeling when we can enjoy our finished work and sense of accomplishment. Perhaps just like your home and lawn, it’s been a long winter season for you spiritually. 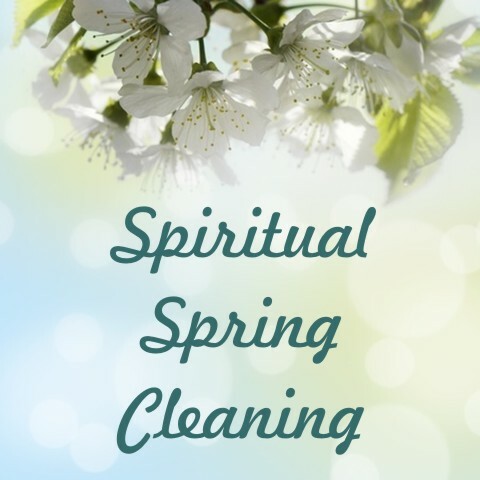 Maybe it’s time for spiritual spring cleaning so that you can be more prepared and used by God for His kingdom work. So pull up your sleeves and get to work with the following checklist! “I obey your precepts and your statutes, for all my ways are known to you” (Psalm 119:168). This is more just a short reading from your devotional—it’s a spring cleaning of the soul including thoughtful and reflective meditations of God’s word. Many of us treat our daily Bible reading as a checklist as if purchasing food items. It’s time to really saturate your thirsty soul with God’s word. “Weeping may stay for the night, but rejoicing comes in the morning” (Psalm 30:5). There’s a time for grieving whether it’s the loss of a loved one, relationships, jobs, or good health. At some point, the eternal perspective must take a strong place in your heart. Perhaps it’s time to wipe your eyes and move in the Holy Spirit for a refreshing of faith in your loving God. The world’s influence isn’t always detected right away. It’s usually after a period of time before you realize how worldliness has affected your thoughts about God, His people, and your spiritual walk. Get rid of everything that clutters your heart from being sensitive to the Holy Spirit’s leading. “Forgive us our sins, for we also forgive everyone who sins against us” (Luke 11:4). After a deep hurt from a family member, friend, or stranger, there may be a long winter season of having an unforgiving heart. It’s difficult to continue in a thriving relationship with Jesus Christ and hold on to a grudge. Wash away the unforgiving attitude in the living stream of Christ’ forgiveness for you. Has your prayer life grown dull? It may be time to wax and buff it up! Try using the Psalms or selected scriptures from the New Testament. It’s helpful to have a prayer partner to keep you on course. Writing in a prayer journal can also bring a new shine and finish to your intercessory time for the unsaved as well as fellow believers. “Let us be sober, putting on faith and love as a breastplate, and the hope of salvation as a helmet” (1 Thessalonians 5:8). A renewing of your relationship with God can bring a fresh joy and hope that you’ve missed along the way. Find a quiet place to reflect on your relationship with Jesus Christ and how the Spirit might be leading you towards a different direction. Let faith and not fear be your guide. As believers we are to stand guard over the thoughts we meditate on. If we become lazy with guarding our thoughts, then our minds can become lax and over time less able to decipher the Lord’s voice. It’s imperative to deal with wandering thoughts at the moment we recognize it. “He will bring to light what is hidden in darkness and will expose the motives of the heart” (1 Corinthians 4:5). What are your motives in service to the church? Do you long for man’s appreciation or reward? Taking the time to check your motives and clean them up releases you to live a guilt-free life. Every stain of impure motive is seen by the Lord and He disciplines those He loves. “For if you live according to the flesh, you will die; but if by the Spirit you put to death the misdeeds of the body, you will live” (Romans 8:13). While we may have good intentions spiritually, our sinful nature or the flesh will constantly pull us in the opposite directions. We must remove the deadness of our sinful nature and its influence on our lives by intentionally cleaning it up. The Spirit of God will quicken to your spirit if your flesh is having more control over you. With fresh air, bright sunny days, and breezy nights—spring has come. Those who long for a new start in their spiritual walk are unafraid of what it takes. Your Heavenly Father longs for you to grow spiritual fruit in the abundance of grace that He has granted you. It is so refreshing to have a Christian writer remind us to “Follow….holiness, without which no man shall see the Lord”(Heb 12:14). Previous post: Is Spanking Biblical?